In mid-May in New York, artist-turned-entrepreneur Vince Kadlubek took the stage at Adobe’s 99U Conference to discuss the potential for creativity to transform reality. He started by showing a series of mundane images of an average American suburb—a freeway, a house, a classroom, a partly cloudy sky—then cut to a family watching television together, and another family in a movie theater. Kadlubek explained that while TV shows and movies once offered an escape from reality, over time, they’ve become just another part of the everyday. At present, he said, we need something more to satiate the human desire for what he calls “mind-blowing experiences.” And artists can lead the way. Kadlubek is the CEO of Meow Wolf, an artist collective and production company that creates large-scale, interactive, multimedia installations. The for-profit company currently operates one meandering, art-filled venue—packed with a Victorian-era house and trippy passageways—known as The House of Eternal Return in Santa Fe, New Mexico. It brought in $6 million in revenue during its first year; Meow Wolf has plans to build two more unique spaces in the next two years, in Las Vegas and Denver. This momentum speaks to the broad appetite for experiential art at present—from immersive exhibitions, like those of Yayoi Kusama, to Instagram-friendly “museums,” like the Museum of Ice Cream—particularly among experience-hungry, selfie-loving millennials. Meow Wolf, however, aims to offer more than just photo ops. Rather, Kadlubek and his colleagues are working towards a future where high-quality, thought-provoking art environments are the norm. Meow Wolf started out on a humble DIY scale back in 2008. (The collective’s name doesn’t hide any mysterious meaning—it came from picking words out of a hat.) Kadlubek and his fellow co-founders—Emily Montoya, Corvas K Brinkerhoff II, Sean Di Ianni, Caity Kennedy, and Matt King—were in their twenties, living in Santa Fe, and pooling their cash and ideas to fill the city’s warehouses and concert venues with DIY installations. “I feel like we started creating experiential art out of necessity, in a weird way,” Kadlubek told Artsy. Meow Wolf, he noted, was launched at the end of an era—President George W. Bush was on his way out, with Barack Obama in the wings. “It was a big generational transition—millennials coming into being adults,” he said. Meow Wolf’s principals were artists and poets, working as promoters for concerts and raves. They decided that more than anything, they craved space. 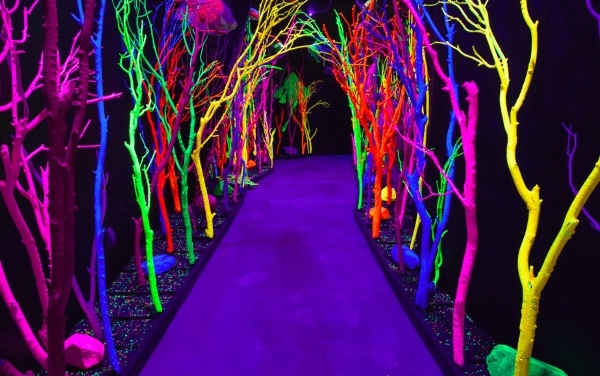 The first opportunity came in the form of a music venue where Meow Wolf was initially promoting shows and dance parties, while also covering its walls in art. “It shifted from music venue to art venue pretty fast,” Kadlubek said. Eventually, the team realized they didn’t even need music to be able to offer an entertaining experience. They instituted an open-door policy so that any new artists who wanted to join in could. This led to a maximalist, collaborative, ever-growing installation, where artists were physically building onto each others’ work. Kadlubek describes the ethos as something akin to the “Yes, and…” principle of improvisational theater, where participants always accept their peers’ contributions. The approach became more orchestrated, however, in 2015. That year, Meow Wolf landed a $3 million investment from Game of Thrones writer George R.R. Martin (a Santa Fe resident), and its members purchased a 20,000-square-foot former bowling alley. This would become its first permanent space, The House of Eternal Return, which has since been compared both to Disneyland and to the immersive theater of Sleep No More. Meow Wolf—by then counting roughly 100 members—aimed for a high-production-value experience with a unique, sci-fi-inflected narrative. The House of Eternal Return is built around the saga of a family living in Mendocino, California, who go missing one night after performing an experiment in their Victorian-era home. Visitors to the installation explore this structure, wander its manicured rooms, and then venture (through a refrigerator door) into an alternate universe of Day-Glo forests, neon creatures, topsy-turvy mirrored rooms, and interactive light and music installations. Meow Wolf took cues from other buzz-worthy immersive art experiences—like Kusama’s “Infinity Rooms,” James Turrell’s light installations, and enveloping animations by teamLAB. “We’ve been inspired by them because they showcased credibility in this type of space,” Kadlubek explained. But at its core, he explained, Meow Wolf has looked to fellow collectives—like Wham City in Baltimore and the Do LaB in Los Angeles—as well as the art that gets made annually at the Burning Man festival. Despite its DIY roots, Meow Wolf is serious about its business model. Adults pay $25 admission, which enables the collective to pay its artist-employees. “We want to be known as a company that stands for artists, that supports artists, that puts artists front and center and gets away from that kind of curator mentality,” Kadlubek explained. “And the way that we’ve really done that is by committing to a salaried, full-time creative team.” Rather than replicating The House of Eternal Return in other cities, Meow Wolf’s members plan to have a full-time staff of over 300 artists who will produce new work for the new spaces—working on everything from architecture and sculpture to augmented reality and audio engineering. “That’s probably the biggest sign that we’re putting our money where our mouth is,” Kadlubek said. In 2019, the team will inaugurate a new permanent space in Las Vegas (they were invited by developers to be the anchor to a mall called Area 15), and 2020 will see them open an installation in Denver (situated in a new, standalone, 90,000-square-foot, four-story building across the river from the city’s Mile High Stadium). Then, Kadlubek explained, Meow Wolf has ambitious plans to open a space in another city every year thereafter. In planning its two future installations, Meow Wolf circulated a request for artists to propose plans for what they’d do with the space; the idea is to align with the tone and aesthetics of the local artistic community. Denver will have “a DIY, grungy feel to it,” while Vegas will be “new media-centric,” Kadlubek said, adding that they’ll be collaborating with the augmented-reality company Magic Leap to layer AR experiences on top of their physical installations. And while one might expect—in the age of the Museum of Ice Cream, and copycats like the forthcoming Museum of Pizza—that Meow Wolf would have a focus on Instagrammable moments, that’s not really the case. Kadlubek said that he finds it more interesting to create experiences that can’t be summed up in a handful of iPhone images. “We want to create something where I could put up a thousand images, I could put up video, but it doesn’t at all even capture the feeling of it,” he said. Kadlubek envisions a future where the lines between things like art, theme parks, role-playing games, and augmented reality will be blurred. The emerging term, he explains, is “alternative reality.” For Meow Wolf, this will mean providing a multitude of alternative reality experiences that are, for the audience, spontaneous and unpredictable. “Meow Wolf in Santa Fe is a node—it’s an art experience seen through the context of consumerism and entertainment,” Kadlubek explained. “People go to a location, they have an experience, and then they go home.” The ultimate goal is for time spent in these spaces to actually change real life—to “subvert” the everyday.